An ultra-chic 4-star hotel/boat hybrid that is currently making waves in Paris. Moored on the beautiful Seine River on the newly trendy Left Bank (just a 4 minutes’ walk from Austerlitz metro/RER station and 2 km from Cathédrale Notre-Dame de Paris) the city’s latest designer hotel offering is the French capital’s first floating hotel and this being Paris they’ve gone all out. 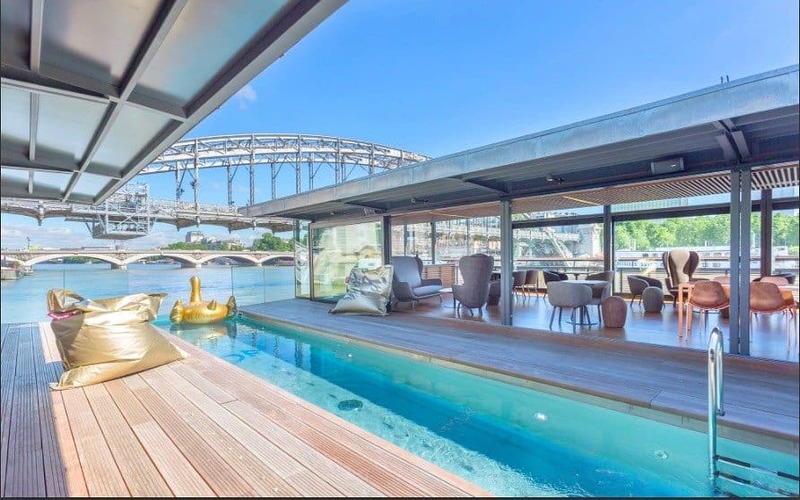 Actually the boat is more like a catamaran and the highly rated Off Paris Seine has two rows rooms stacked over two levels, but connected by a narrow stretch of a sky-lit communal space complete with a swimming pool, a bar and a sun deck adorned by lounge chairs. The room decor is equally as fancy with a modern minimalist decor, free WiFi, flat-screen TVs. Opt for a suite and expect feature in-room soaking tubs or four-poster beds. 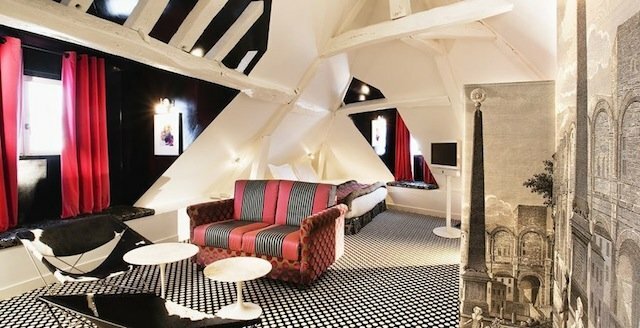 All rooms at this very cool Parisian hotel offer either gorgeous river or docks views (of course)! Prices from €90 per night. 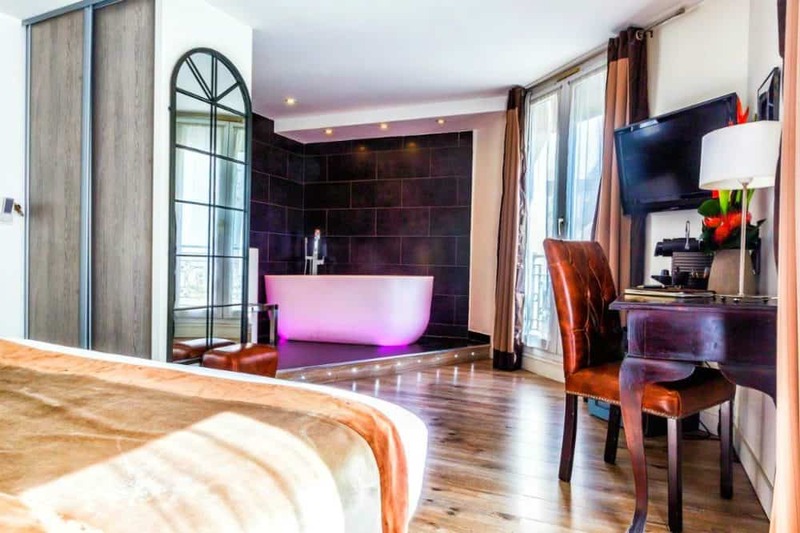 If you’re looking to seriously impress your loved one, this exceptionally trendy Paris hotel of only one suite has been specifically designed to provide a beautiful base for the ultimate romantic weekend. In fact there are actually two hotels in one – opt for a room in the chic boutique the highly rated Five hotel and you’ll find rooms at very reasonable prices (around €70 a night) but it’s the exceptionally rated One by the Five Suite (part of the same Five Hotel) which promises to offer something truly special, although for a higher price of course. Delivering a dreamy and romantic accommodation experience, it cleverly merges the cosiness of a boutique hotel, advanced technology, and a sleek creative design to create a truly unique Parisian stay – the hotel draws rave reviews from many a happy customer. The suite offers a handmade bed adorned with satin bedding, playful mood lighting and music composed exclusively for your room making your beautiful romantic hideaway complete. You can’t argue with the fabulous location, surrounded by bars and restaurants, the hotel is based on the 5th arr. an 8-minute walk from both Les Gobelins and Censier – Daubenton metro stations which will allow you to easily explore the rest of the French capital. Definitely cooler than your average mid-range accommodation, the highly rated Mama Shelter is quickly becoming one of the most popular unique hotels in Paris. Catering to a hip and fun loving crowd, this hotel would appeal to anyone who appreciates the quirkier side of life. Located only a stone’s throw from both a cool music venue and the Alexandre Dumas Metro Station (which provides easy access to the beautiful Montmartre district and also the rest of Paris) we also loved the onsite gift shop, pizzeria and fab cocktail bar! 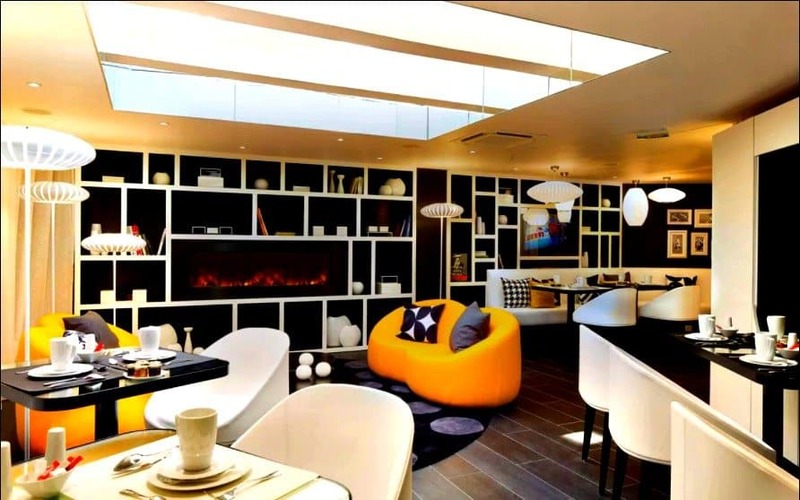 The funky Paris abode was designed by the acclaimed industrial modern designer Philippe Starck, so expect plenty of trendy details – elevators papered with trivia, superhero masks placed playfully in every room, walls of exposed concrete and super hip iMac televisions placed in every room. 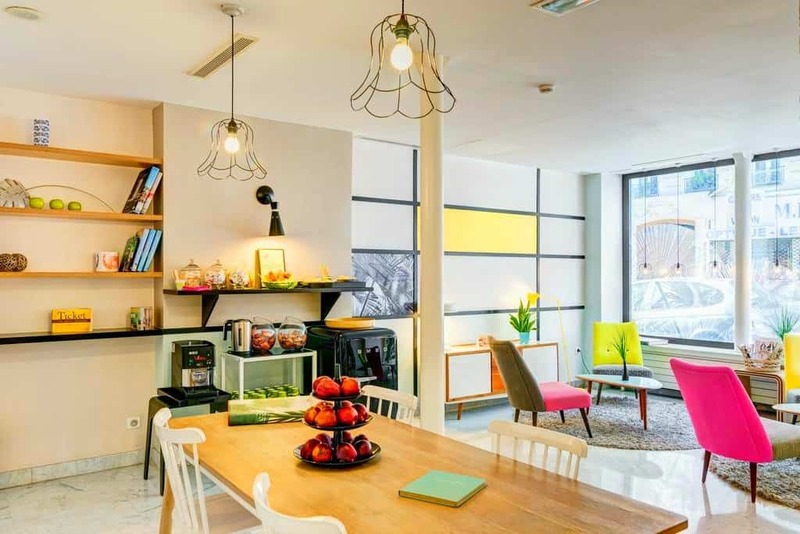 We personally think you’ll love the design here but even if the decor isn’t quite to your taste, the great room rates and accessible location still make this an excellent choice for a very cool accommodation option in Paris! Prices from €80 a night. One for all the trendy jet-setters and party goers out there, this ultra-cool and highly rated conceptual Paris design hotel can be found in the lively Chapelle district not too far from Moulin Rouge, Sacré Coeur and the beautiful Montmartre district (and only a 2-minute walk from La Chapelle Metro station which provides direct access to Gare du Nord and Stade de France). Don’t be fooled by the Kube Hotel‘s classic stone built exterior, it cunningly belies the bold and futuristic delights waiting just inside. Check in at the wonderful perspex cube reception (located in the courtyard) and step through the hotel doors to find a multi-faceted Plexi-glass cube adorned with funky faux sofas, hanging perspex ‘bubble’ chairs, colourful bean bags, designer furniture and plasma screens creating a wonderfully eclectic contemporary kitsch ambience (think Boogie Nights and Saturday Night Fever mixed with Blade Runner or Space Odyssey!). The rooms are pretty high-tech too and many are home to funky hanging beds and more lashings of perspex. Although arguably the hotel’s real show stopper, is its very own Ice Bar carved out of 25 tons of ice, where at minus ten degrees Celsius, visitors – and random celebrities – can sup on vodka-based cocktails well into the early hours! Prices from €90 a night. A wonderfully flamboyant mid-range but exceptionally rated hotel in Paris which is about as far away from a sterile chain hotel as you can possibly get. Think of the Hotel Crayon Rouge like the perfect French macaron; small, colourful, and bursting with individual flavour! 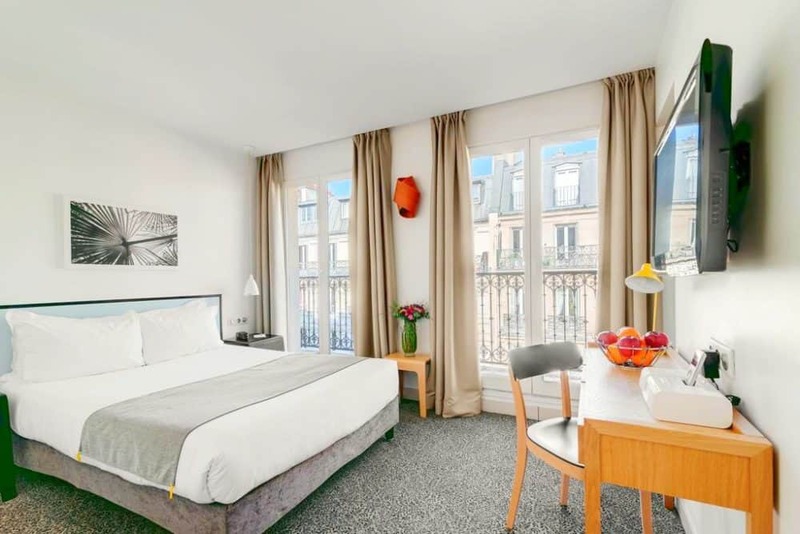 It’s also located in an outstanding area located in the historic centre of Paris, right next to Palais Royal and within walking distance of all the Parisian favourites such as the Musée de Louvre, Notre Dame and the River Seine. The wonderfully trendy retro/modern interiors at this hip Paris hotel offer more than a whiff of seventies nostalgia, and a riot of tangy colour schemes, imaginative printed wallpapers and retro flea market finds, offering a true visual feast. Expect a laid-back but chic guesthouse ambience, oh and a marvellous wine bar too! A cake themed room you say? Fantastic! This 4-star exceptionally rated Paris gem is kitsch and conceptual from the floorboards to rafters so it may not be everyone’s cup of tea but it sure was mine. Vice Versa Hotel‘s seven floors are themed each representing one of the seven deadly sins, I stayed with the gluttons and my bed was a cupcake and my lamps were teapots – happy days indeed! The 15th arr. location is also pretty fabulous, only a short walk from Convention Metro Station which will take you directly to the Champs Elysées – a great choice for romance, monuments and city walks. Wandering around the communal spaces and corridors of this deliciously quirky Paris hotel I could see snatches of each sin…greed heavily revolved around banknotes, anger around red black and revolvers and lust was like immersing yourself inside a racy corset! 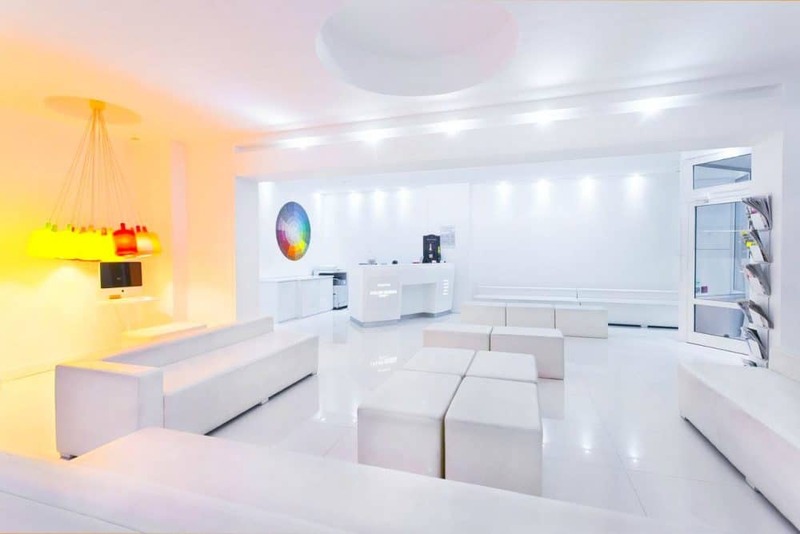 The unique pristine pure white lounge has to be seen to be believed and the friendly staff and the general tongue-in-cheek but relaxed atmosphere also add to the experience. 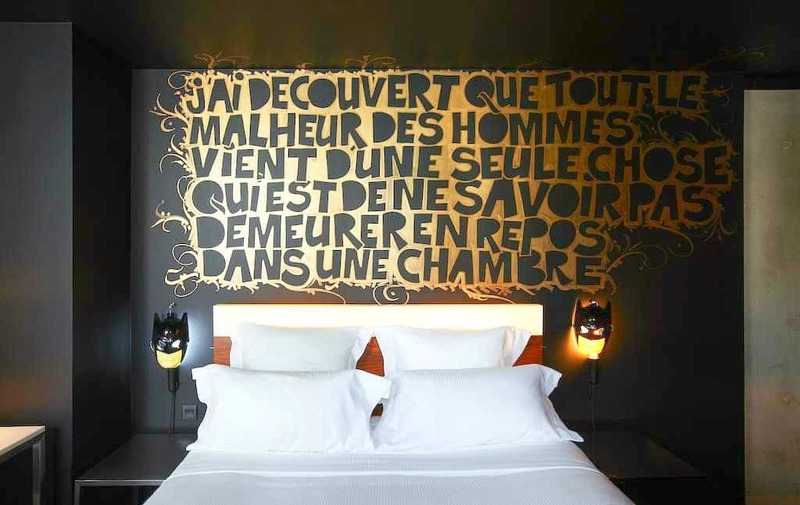 A novel and very hip hotel in Paris which cannot fail to inject a bit of fun into your stay! Prices from €75 per night. Striking and elaborately designed, the 4-star exceptionally rated Le Bellechasse sits comfortably within the narrow streets of the trendy Saint-Germain district only a short walk from Solferino Metro station (on the 7th Arrondissement), only a 100 yards from Musee d’Orsay and a great choice for travellers interested in romance, fine art museums and art. 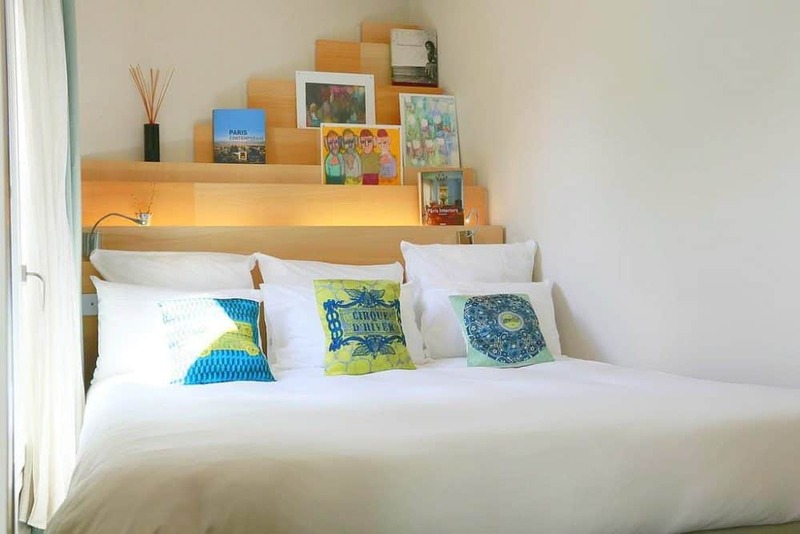 This hip Paris hotel is not even the tiniest bit out of place amongst all the prestigious art galleries and antique shops dotted around this area, this quirky designer Paris boutique hotel offers a visual feast in gigantic portions. Le Bellechasse has been completed decked out by the genius and creative mind of famous fashion designer Christian Lacroix in a typically Parisian decadent style (circa the 19th century). 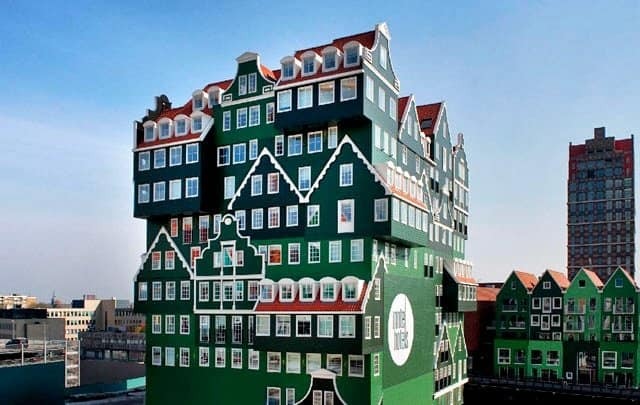 If you decide to stay at this deliciously unique hotel – prepared to expect the unusual. Oddities include giant wall butterflies, winged dandies and enormous playing cards, but yet the very cool Paris hotel still manages to remain both opulent and utterly tasteful! Wonderful! Prices from €110 per night. 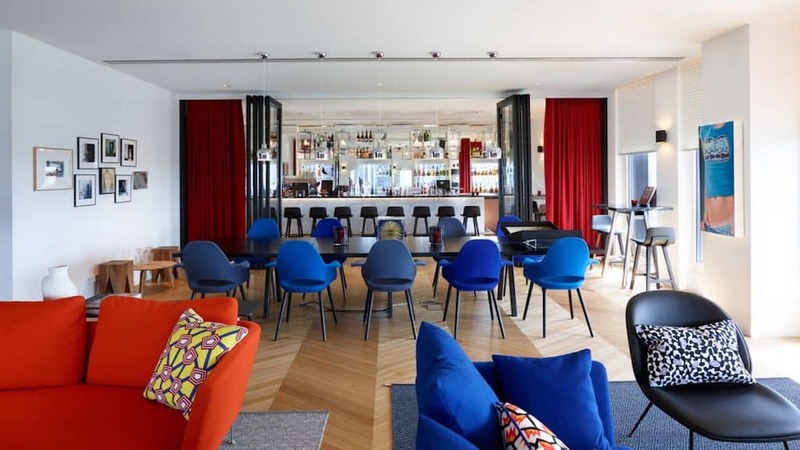 Located in the historic neighbourhood Bercy in central Paris, the ever-popular exceptionally rated 4-star CitizenM Gare de Lyon is a great choice for a funky stay in Paris. With 338 rooms close to the Seine and one of the top transport hubs in the city, the hip Paris hotel is a great base to explore Paris. Rooms have king-sized beds with the best Italian linen and a tropical rain shower in each room. The cool MoodPad lets you control the room and there’s free Wi-Fi, unlimited free movies and smart TVs in all rooms. 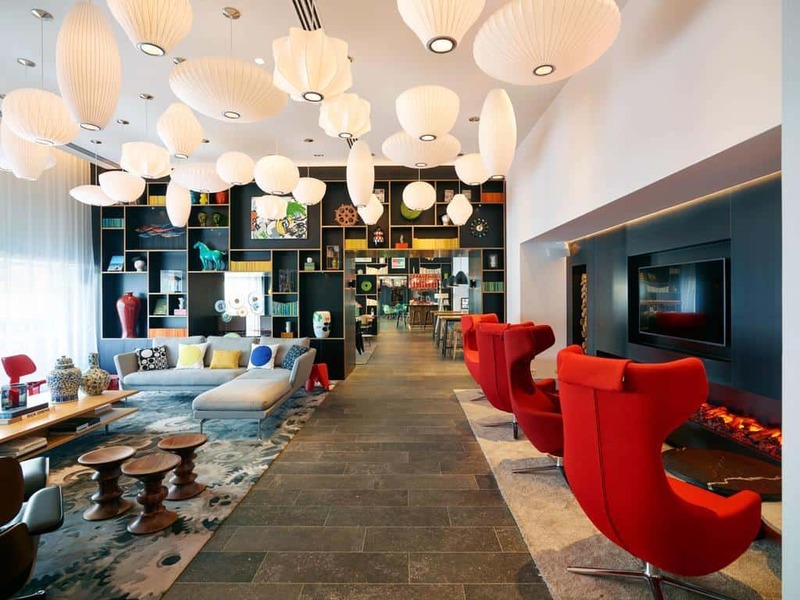 There are lashings of funky fun and colour at the CitizenM and the lobby area has stylish Vitra furniture and plenty of workspaces too. Set in a beautiful neoclassical building and a place once frequented by socialites and intellectuals, 5-star Belle Époque themed and exceptionally rated Maison Souquet really stands out from the crowd. 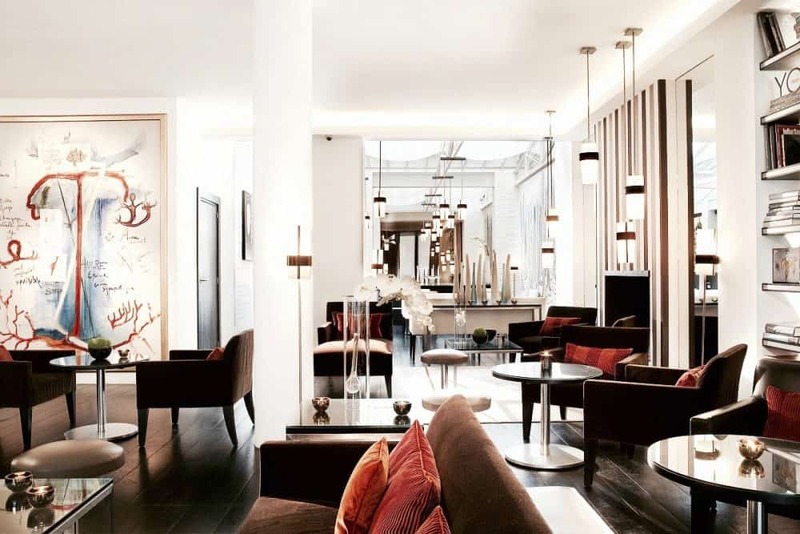 The style – designed by Jacques Garcia – is opulent and decadent with a mix of exotic and Second Empire–style furnishings creating a truly unique ultra-chic setting. 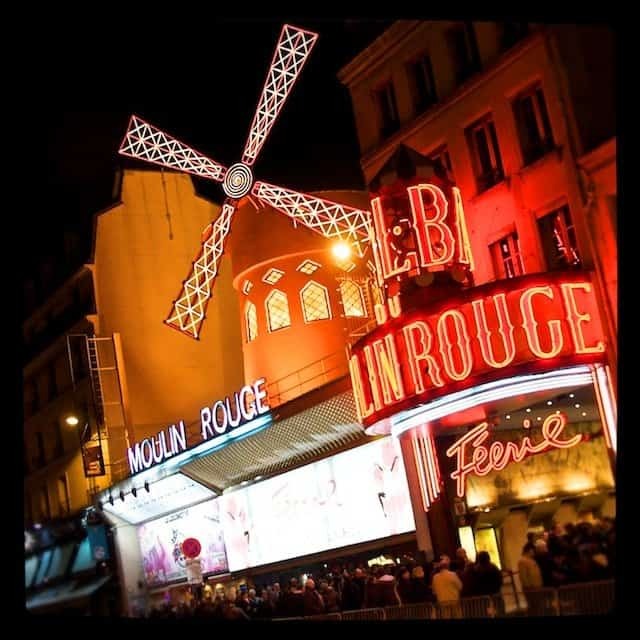 Its location in the cool and beautiful artistic district of Montmartre – Paris’ last village – only a minute’s walk from Paris’ famous Moulin Rouge (and only 150 yards from Blanche Metro Station which gives you direct access to the Champs Elysées), is also equally very fitting. When you open the doors to this gorgeous Paris abode you’ll walk into a Moorish-style tiled salon, recuperated from a mansion in Brussels, also expect to gaze upon plush Napoleon III crimson velvet chairs, a wood-panelled bar-library (with books and backgammon aplenty), a glass-roofed conservatory, a spa with an indoor pool, a hammam and a delightful courtyard. With meticulous attention to detail, the scent of jasmine and tobacco gently wafts throughout – a slice of Paris time forgot! Prices from €230 per night. 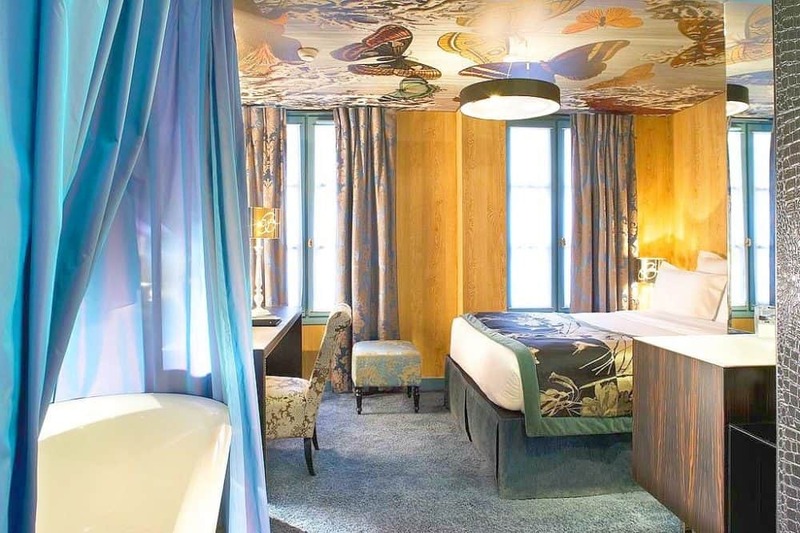 Another ultra-fashionable Paris hotel where Christian Lacroix has been given a free reign on the decor! Located only a very short walk from the Musée National Picasso and the Notre Dame and gorgeous boutique shops galore (and Filles du Calvaire Metro Station is only a 5-minutes away which offers direct access to the Eiffel Tower and Opéra Garnier), the former oldest bakery in Paris (would you believe!) has been beautifully refurbished resulting in a delightfully intimate and exceptionally rated 4-star boutique hotel adorned with large lashings of the acclaimed fashion designer’s famous flamboyance. 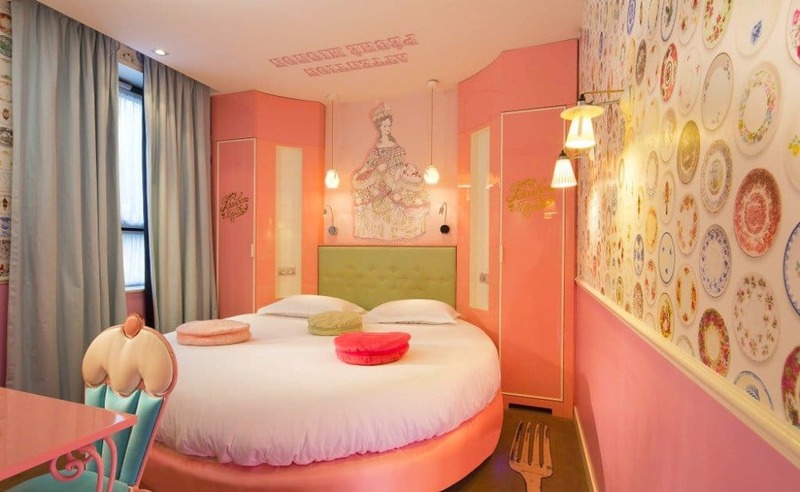 Each room at the fabulous Hotel Du Petit Moulin has been individually designed and one even features scribbles and drawings taken from Lacroix’s very own sketchbook – expect a colourful, intimate and modern boudoir style Parisian accommodation you certainly won’t forget in a hurry! Prices from €150 a night. 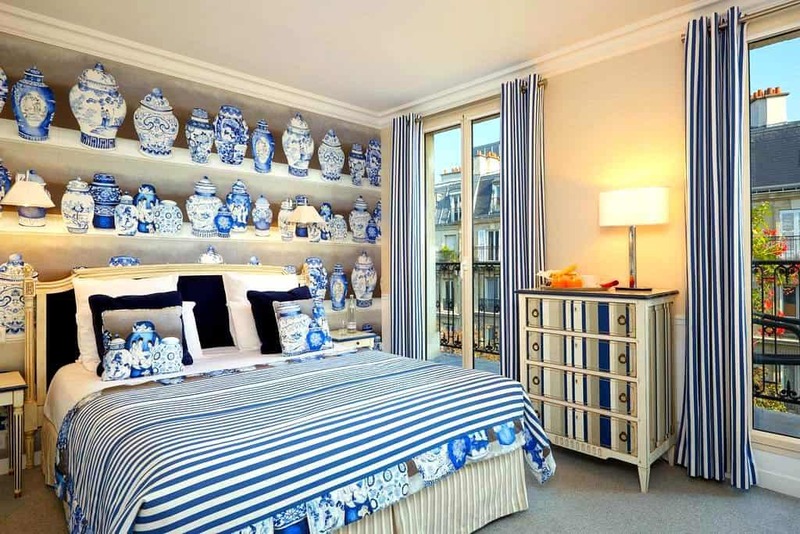 This is a hip new 4-star Paris boutique hotel which is all about the details! Its location is pretty spectacular too. 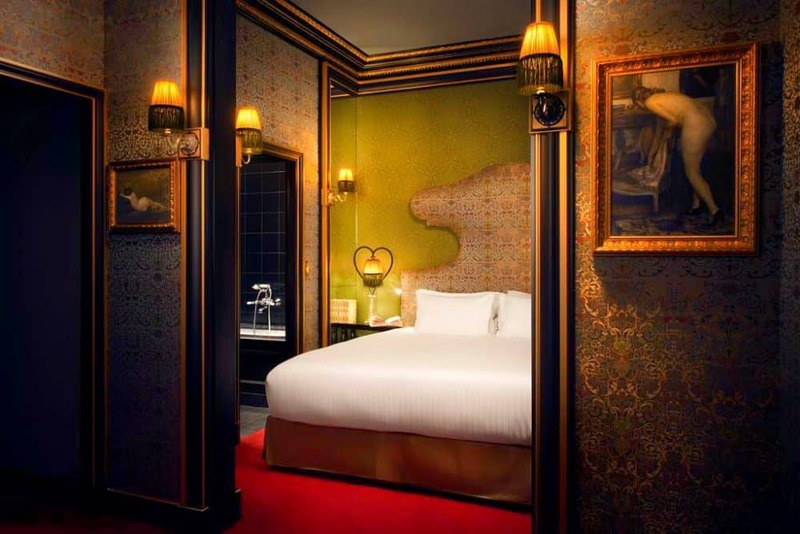 Hotel Jules and Jimi is located in Le Marais, a historic central district in Paris which has been long been the aristocratic district with a fine collection of outstanding buildings of historic and architectural importance. It’s also located only a block away from the Arts et Métiers metro station for easy access to the rest of the city, a few streets north of the Centre Pompidou and is only 3 km from the Louvre. The decor is relaxed but stylish and as the hip Parisian accommodation is named after the Truffaut film, there are hints of the theme throughout. The modern individually styled rooms offer free WiFi, flat-screen TVs and iPod docks and are centred around a pretty courtyard which features a planted wall and a real outdoor fireplace (and it also doubles as an art gallery). 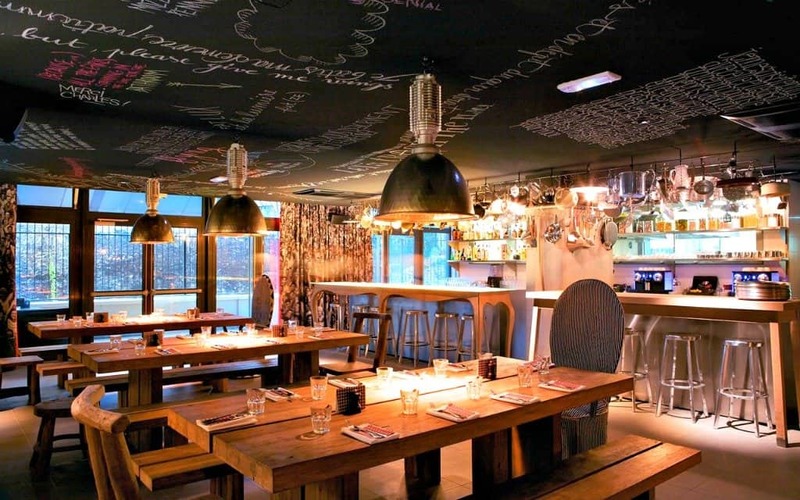 Other stand-out features are the intimate pop-up cinema in the vaulted cellars, a wine bar is housed in a converted silversmith’s workshop, quirky extra services such as a tour in the hotel’s own vintage DS or cruise in a former Venetian taxi boat. Just a little tip, opt for a room with a balcony and views of the Sacré-Cœur or if you can splash out, book the bi-level suite which comes with a gorgeous living area! Prices from €130 a night. 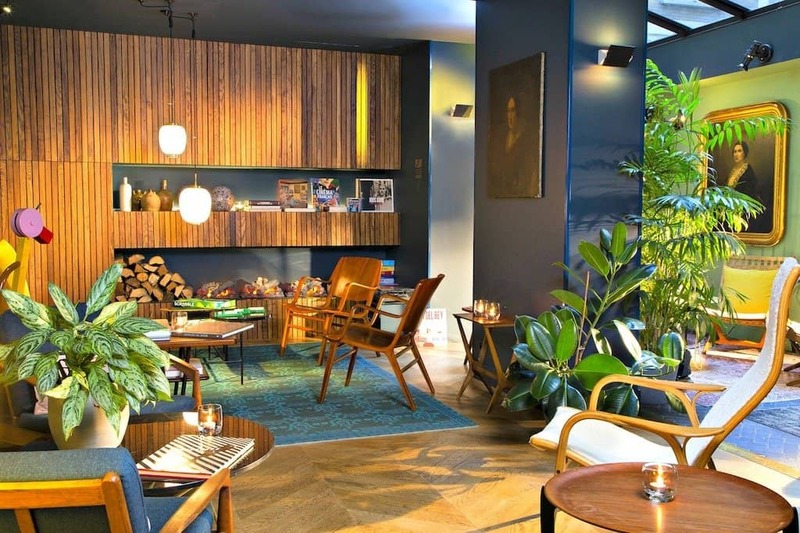 This is a cool little Paris boutique hotel in the bohemian and artist-haunt area of Montparnasse (only a 10-minute walk from Montparnasse Train Station which easily connects you to the rest of the city). 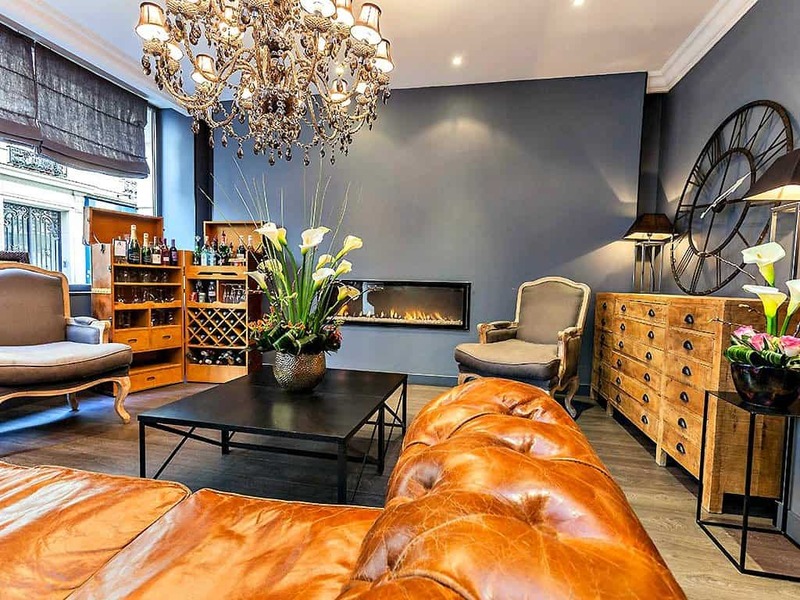 Stylish and eclectic, the lobby at the highly rated Hotel Atelier Montparnasse is instantly cosy and welcoming with worn leather sofas, exposed brickwork, hardwood floors and a well stocked communal bookshelf. Rooms range from the romantic to the contemporary minimalist and I stayed in a double room which was elegant and comfortable with plenty of cool and unusual features – the décor, for example, was a hat tip to the early 1900’s with soft fabrics in lush colours and an amazing Italian shower. It was light and bright and clean, the price was completely reasonable and the buffet breakfast – which was filled with freshly-baked French bread and pastries – was tasty too, plenty of reasons to love this place! Prices from €70 a night. The lively area of Pigalle is synonymous with arty hangouts and Can-Can clubs and the hotel of the same name is one of the area’s hippest new spots. Perfectly capturing the district’s creative, artistic spirit, the dream team of architects Charlotte de Tonnac and Hugo Sauzay and hotelier Valéry Grégo formed 4-star and exceptionally rated La Pigalle Hotel with a fusion of works by local artists, music by neighborhood DJs, and foodie treats from a nearby bakery – the result is an understated but smart hipster hotel where you’ll want to be seen! The trendy standard rooms feature neoclassical decor, vintage furniture and free iPads and upgraded rooms offer suites, turntables and hand-picked vinyl record collections. 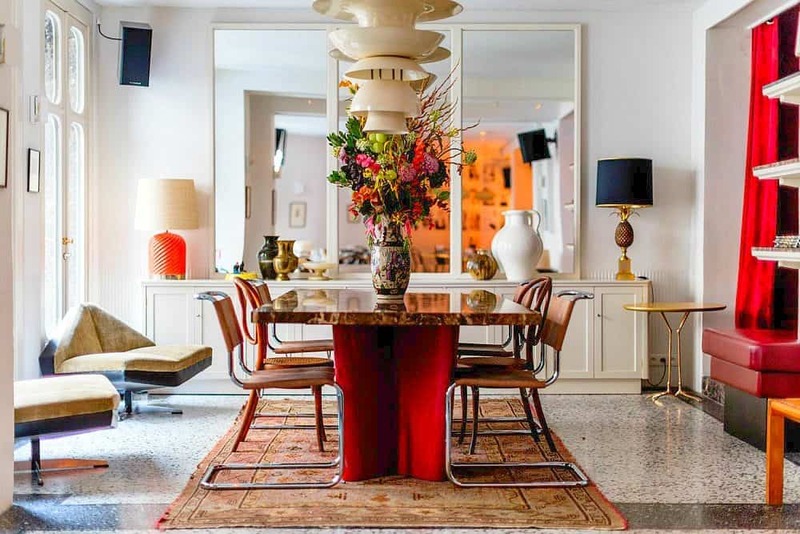 Also expect an eclectic cafe, a basement lounge complete with a curated jukebox, the occasional party and live entertainment and only a short walk to Pigalle metro which will easily connect you to the rest of the city. A very cool Paris hotel indeed! Prices from €85 a night. 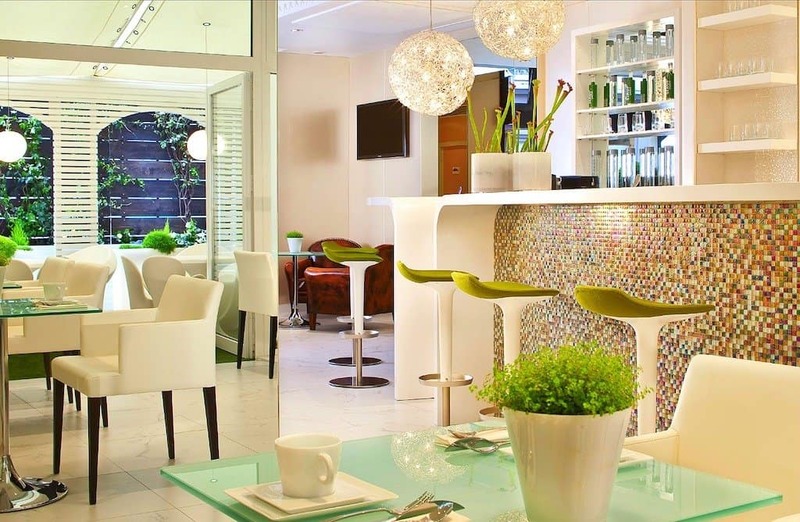 This is a chic little oasis in the heart of the French capital, close to the Eiffel tower which prides itself on luxury and impeccable service. I walked into the 4-star highly rated Hotel 7 Eiffel and immediately admired the shimmering tiles and the Monet shades of the contemporary yet classic interior. The sense of calm at this hip Parisian hotel continued up into the gorgeous roof-top garden too where you can enjoy a cocktail and admire the beautiful Parisian cityscape views. My room was a further extension of the exquisite taste and tranquillity and featured gorgeous voile drapes, quality cotton bed linens and a deliciously luxurious rain shower too (which was very hard to get out of)! I especially liked the separate changing area which helped me feel more settled and dissuaded me from flinging my clothes around the room in my usual fashion. A beautiful place and a location that’s hard to beat too (only 8-minute walk from the Musée de l’Armée and only 14 minutes’ walk to the Eiffel Tower)…definitely a fabulous find! Prices from €100 a night. This highly unique and very hip 4-star Paris hotel is situated in the vibrant restaurant-adorned area of the centrally located Latin Quarter (only a 10-minute walk from Luxembourg Gardens and a 5-minute walk to Censier-Daubenton Metro Station, which offers direct access to Le Louvre and the Opera Garnier). 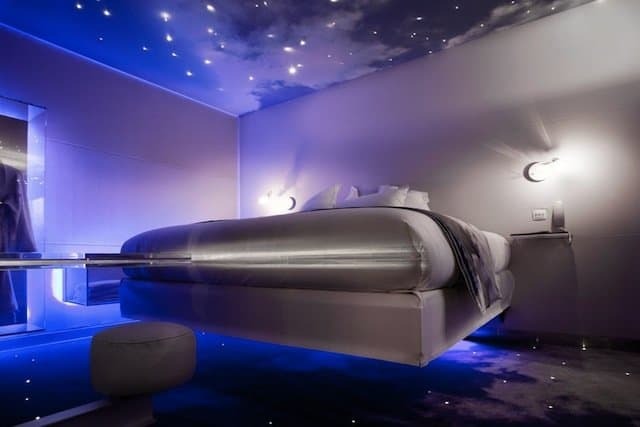 This is a high-design and high-concept hotel which has such beautifully unusual decor it’s likely to blow your socks off. 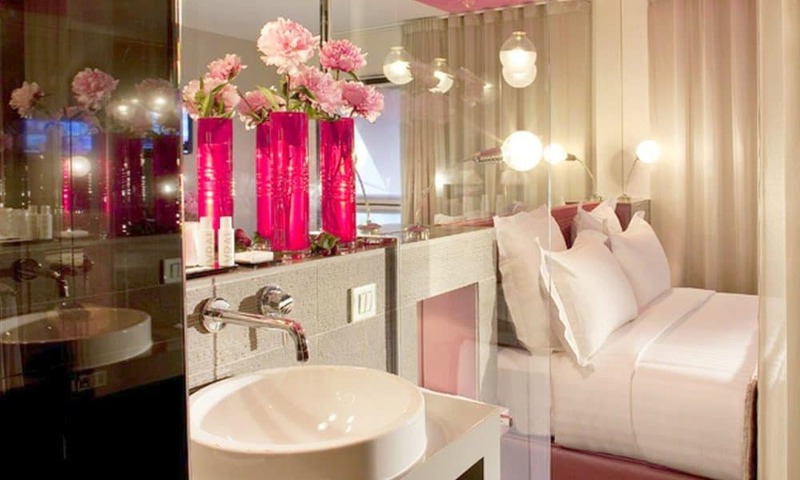 The exceptionally rated Seven Hotel is a popular choice for something a little different in Paris and we can easily see why – as well as all the usual mod cons it’s home to some ultrachic romantic guest-rooms complete with a high-tech theme, fibre-optic lighting, and even beds that appear to float. All have free Wi-Fi, Nespresso machines, flat-screen TVs, iPod docks and in-room massages as an optional extra and some room have some transparent walk-in showers. 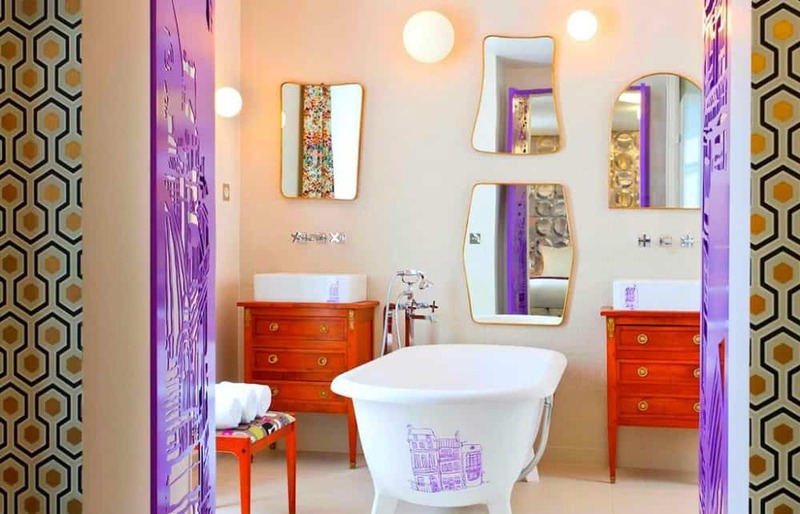 Opt for an achingly hip individually designed suite and you’ll benefit from relaxing soaking tubs and sitting areas. Oh and if that’s not enough of a reason to stay, there’s also a trendy bar, a wine cellar and a furnished courtyard too – fabulous! This is an ultra-stylish and unique concept Paris hotel which can sometimes mean pretension rules over anything actually useful…not here though! Four-star and exceptionally rated COQ Hotel Paris is a lovely little oasis in the heart of the city only three miles from the famous Notre-Dame Cathedral (on the 13th district where Place d’Italie Metro Station is a 5-minute walk away which offers direct access to the Eiffel Tower and Montparnasse Train Station). Gorgeously decorated in a kind of modern vintage chic with antique-style artwork, plenty of plants and soft fabrics and splashes of brave colour, not to mention wooden panels, a cozy sunroom and even a wood burning stove, this hotel is full of really beautiful decor! The rooms at this swanky Paris stay are all unique and mine was stylish, not overly large but plenty of space for me, art on the walls and a cool tiled wet room and oval bathtub, a little coffee machine and a super comfy bed. Although my absolute favourite thing had to be the friendly courtyard chickens who provide fresh eggs for the hotel’s delicious breakfast – delightful! 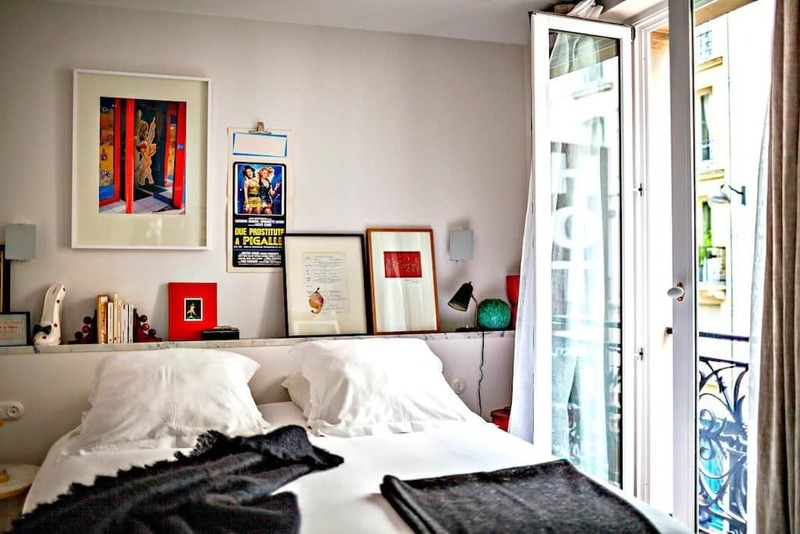 Located in the fashionable Marais district with shops and restaurants galore (and very near the Filles du Calvaire Metro Station) which will give you direct access to Opéra Garnier and Galeries Lafayette). 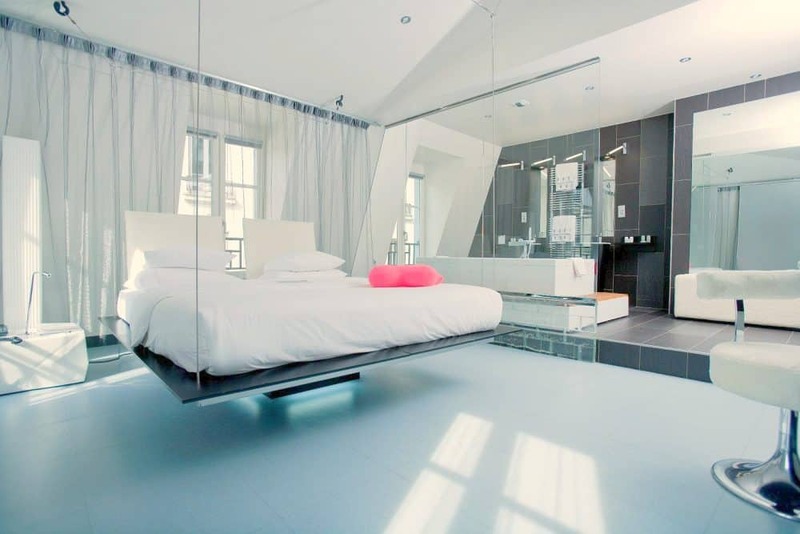 This 4-star trendy place to stay in Paris is an amazing blend of hip contemporary and full-scale luxury! 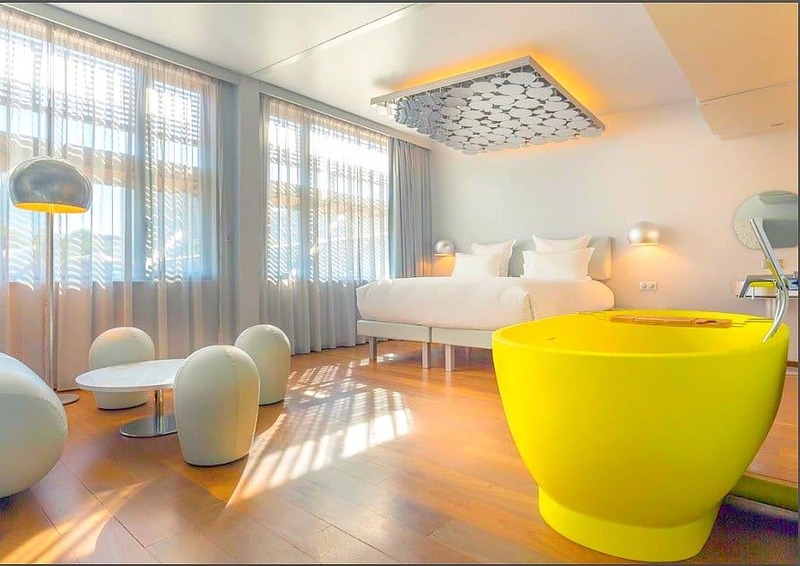 The highly rated Hotel 1k is full of cool contemporary-retro furniture and bold bright colours. This gem of a place has Mexican/South American inspired theme and includes a delicious Peruvian buffet, a proper secret prohibition-style speakeasy, a rooftop pool, a state of the art gym and a touch of a ‘Day of the Dead’ vibe. 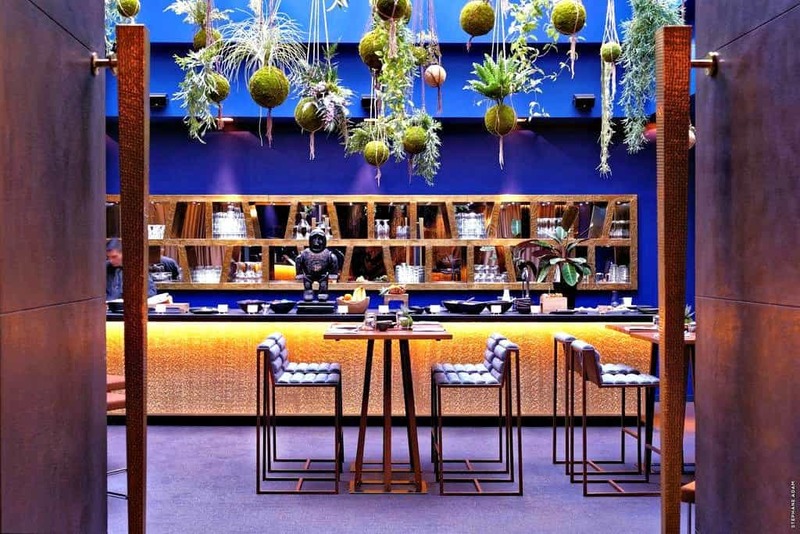 The very cool hotel bar serves up fierce tequila-like beverages in a happily furtive and intimate environment – make sure you try one before you leave! My room was dreamy and came with a huge, ridiculously comfortable bed and modern gadgets galore. Every room has full connect-ability regardless of whether you’re an Apple or an Android kind of gal and I thoroughly enjoyed playing my music through the cool speakers whilst admiring the fab childlike paintings on my wall. I even like the exterior of the building with its classic blue and white facade. It’s a place I definitely felt hipper when I left than I did when I arrived! Prices from €110 a night. A unique family-friendly Paris boutique nestled in the newly artistic area of Canal St-Martin where scenery consists of pretty locks, cobbled quaysides and iron footbridges. The exceptionally rated Le Citizen is also an area which has a thriving bar culture and with only a 6-minute walk from Jacques Bonsergent metro station and a 9-minute walk to the Gare de l’Est train station, it also a great place to base yourself for easy access to the rest of Paris. Inside the decor is modern, bright, stylish with a handcrafted feel with pale wood, colourful cushions and designer furniture made by acclaimed furniture designer Christophe Delcourt. Mod cons at this trendy Paris hotel aren’t forgotten either and all the rooms offer free Wi-Fi, flat-screen TVs and even iPads – and for the suites – loaner smartphones. Although arguably the biggest draw are the gorgeous canal views – bliss! Epitomizing the boho-chic of Paris’ Left Bank, 4-star highly rated Hotel des Academies et des Arts pays homage to the legendary artists who once painted this part of town red over the years. 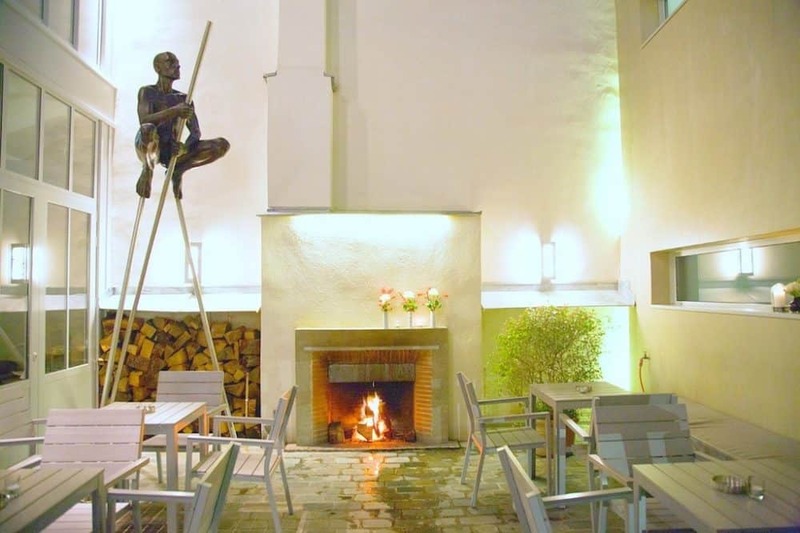 You’ll find this cute, romantic and unique boutique hotel in Paris’ historic Montparnasse district (only 3-minute walk to Vavin Metro Station which will connect you to the rest of Paris) which was famous for being the centre of Paris artistic and intellectual life. James Joyce, Hemingway and Picasso were among the painters, writers, poets and sculptors who frequented the bohemian cafés along Boulevard Montparnasse. All the rooms at this chic and contemporary Paris hotel have thoughtfully renovated by either the artist Jérôme Mesnager or the sculptor Sophie de Watrigant and the result is a beautifully elegant art hotel which radiates a cosy atmosphere. Gorgeous artistic details aside, other hotel highlights include a luxurious wellness area and even a fabulous cinema room where you can gaze at films of your favourite artists to your heart’s content. 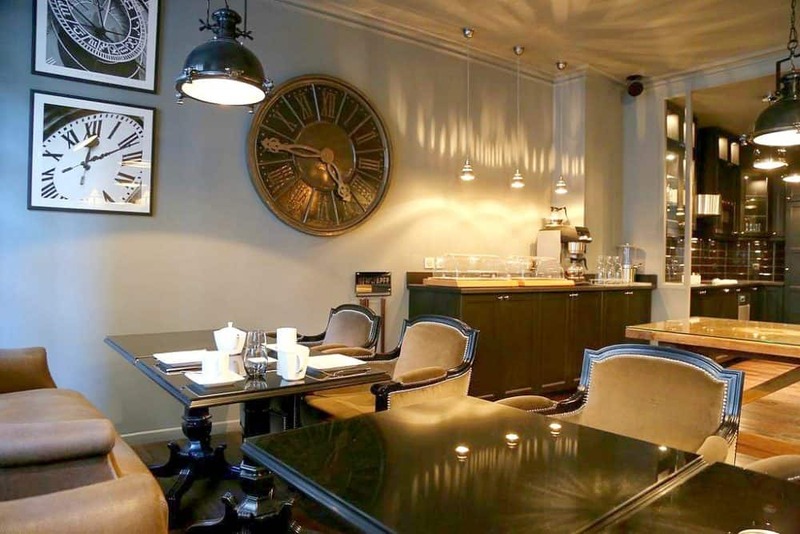 Set in central Paris, just one mile from Gare du Nord Station and only one mile from the Louvre and the Palais Garnier opera house, the exceptionally rated Hotel Palm Opera is purely 1920’s black and white Parisian class, but once inside I got a very pleasant surprise. The contemporary Parisian accommodation is decked out in an unusual and cool modern/retro furniture with a nod to 1960’s shapes and textures in a cool acid colour palette – very vintage chic! It’s clean, sharp and uncluttered with just the right amount of detail…sort of how I imagine a Californian music mogul’s private pad to be. The room was light and bright and comfortable, upgraded rooms feature private balconies and the continental buffet breakfast was very tasty too. The hotel was in a pleasant area of the city, very close to a metro station and just a short hop to all the main attractions. Well worth the money and a very trendy place to stay in Paris! I was thrilled when I approached the exceptionally rated gorgeous Parisian facade of this hotel, tall white and beautiful, just around the corner from the Moulin Rouge (and only 3-minute walk to the nearest metro station and 1 km from the iconic Sacré-Coeur and pretty Montmartre). Pigalle is historically the place where artists and Can Can dancers merged in a marvellously bohemian clash of forbidden pastimes, muses and colour… it still holds that mysterious charm and it’s a lively area to spend a few days in Paris. The classic modern Parisian hotel didn’t disappoint on the inside either, Hotel Saint Louis Pigalle is tastefully decorated like a black and white movie set in vintage monochromes but somehow manages to feel warm and welcoming too. My room was clean and comfortable and cosy with a lovely big bed, powerful shower and everything I needed to enjoy my trendy Paris stay. The best surprise was the glimpse of the top of the Eiffel tower that I could see from my balconied bedroom window – the hotel just made everything feel very authentic… it’s a very charming and romantic place to stay in Paris at a surprisingly reasonable price too. Right in the heart of the vibrant and central Latin Quarter (just 1 minute on foot from the Maubert–Mutualite Metro and Boulevard Saint-Germain), one of the oldest districts in Paris at the epitome of arts and culture is this beautiful nostalgic chic Paris hotel which immediately transports its guests back to the romance of the Belle Epoque, the city’s golden age. The highly rated Hôtel Saint-Jacques is full of treasures, valuable books and paintings from the great artists of the turn of last century. The rooms and communal spaces are a homage to the era – I enjoyed an absinthe in the Toulouse Lautrec bar and breakfast in one of the hotel’s Belle Epoque cabaret style dining areas. My room was full of charm with moulded ceilings, velvet drapes and striped wallpaper – I felt like I’d been beamed back in time to a lost era! The time travel didn’t extend as far as the amenities though I must add and I had all the mod cons required to make my stay comfortable. I probably could have done without them though, as I was happy enough just to be revelling in my own little historical drama and coming back to the modern day was a bit of an anticlimax! 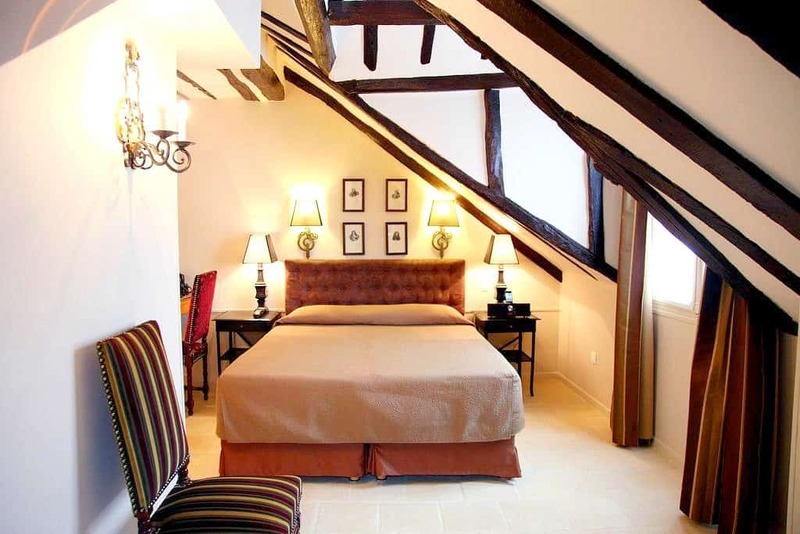 I’ll definitely be going back to Hotel Saint Jacques when I need to soothe my vintage soul! 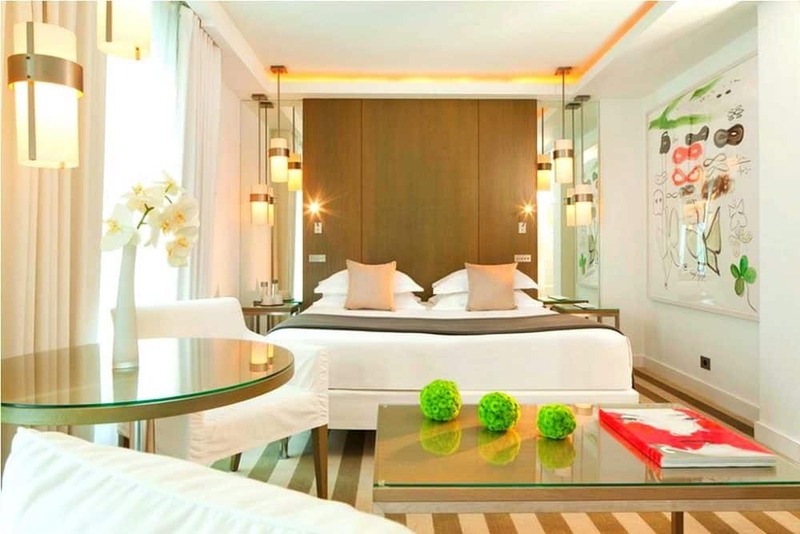 Just a stone’s throw from the designer stores on Champs D Elysses, the mid-range centrally located and exceptionally rated Hotel Ekta is like a fashionista’s fantasy! 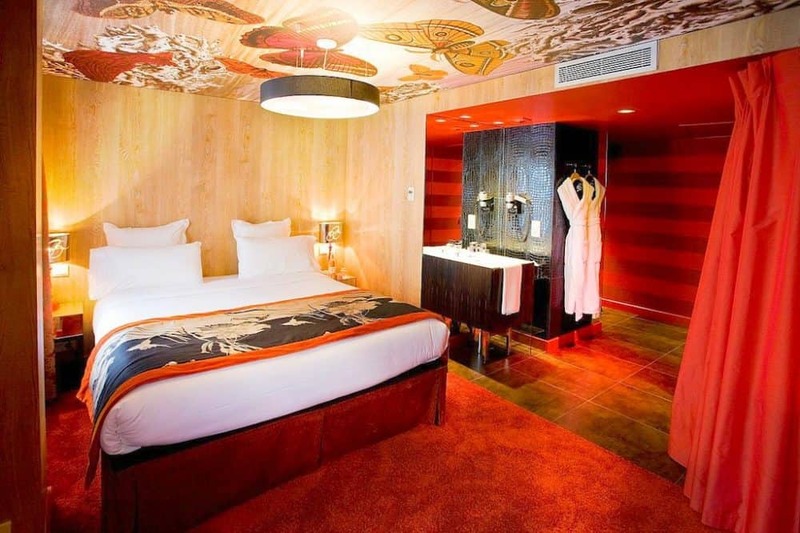 The whole interior at this swish trendsetting Paris hotel is impeccably decorated in a psychedelic 1970’s style inspired by designers. Jean-Philippe Nuel and Natasha Stojkovic, with loads of visually arresting geometric shapes and sharp fashion photography, even a mannequin here and there, it’s super cool if a little Austin Powersy! My room was comfy and well equipped with a smart TV, free WiFi and a view of the Arc du Triumph. The staff were friendly and the service felt very warm and personal, they really added to an already awesome atmosphere. 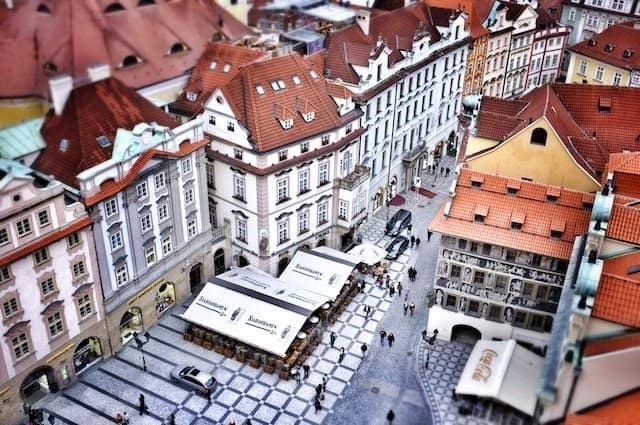 A very cool hotel and well worth a visit, even if the closest you’ve ever got to Louis Vuitton handbag is several metres away with a pane of glass in between….here you’re allowed to dream! 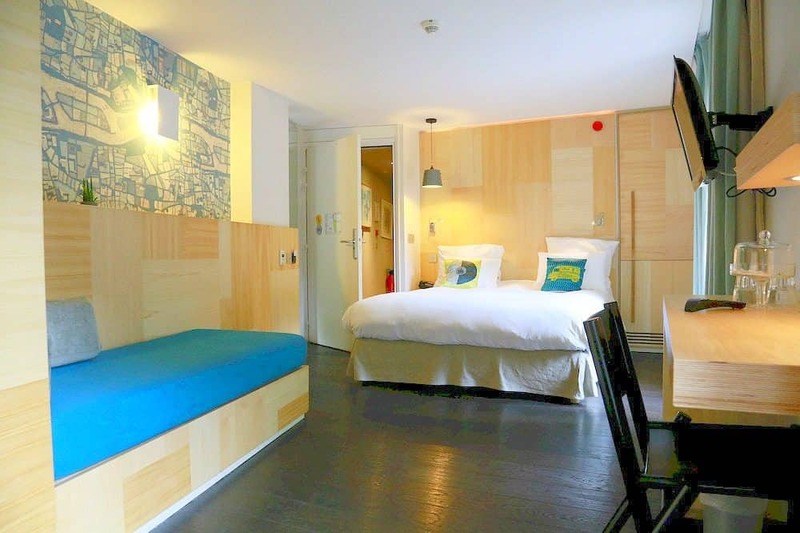 A great choice for a unique lower priced accommodation in Paris, this fun and funky modern 3-star hotel is an only an 11-minute metro ride from the Opéra Bastille in the fashionable Bastille district in Paris. The highly rated The Color Design Hotel has a white minimalistic design interspersed with the odd splash of colour, fluorescent perspex and futuristic silver. To keep things even more interesting, each floor at this swish Paris abode has its own individual colour theme so you’ll have fun exploring the different levels if that’s something that takes your fancy! Rooms are cool and contemporary but more comfortable than luxurious, although you can still expect the usual mod cons like flat-screen TVs, free Wi-Fi, double-glazed windows and iPod docks are available on request. 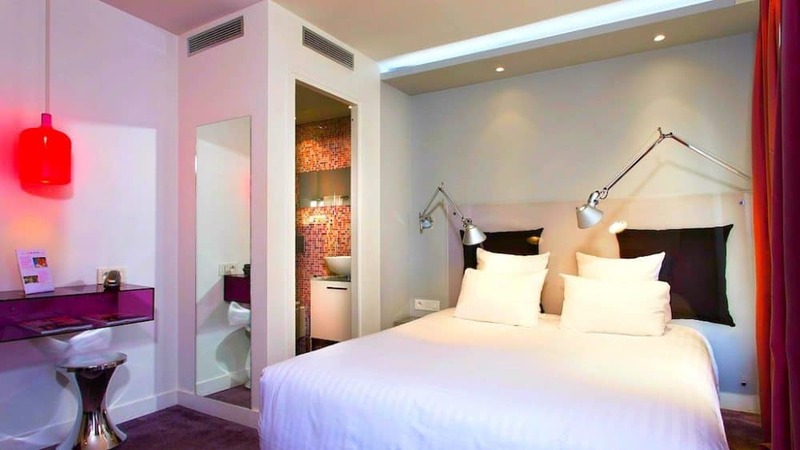 Breakfast isn’t included in the room rate but this is still a great find in Paris for anyone wanting easy access to great bars, restaurants and fashion stores for a price that certainly won’t break the bank! Prices from €50 a night. 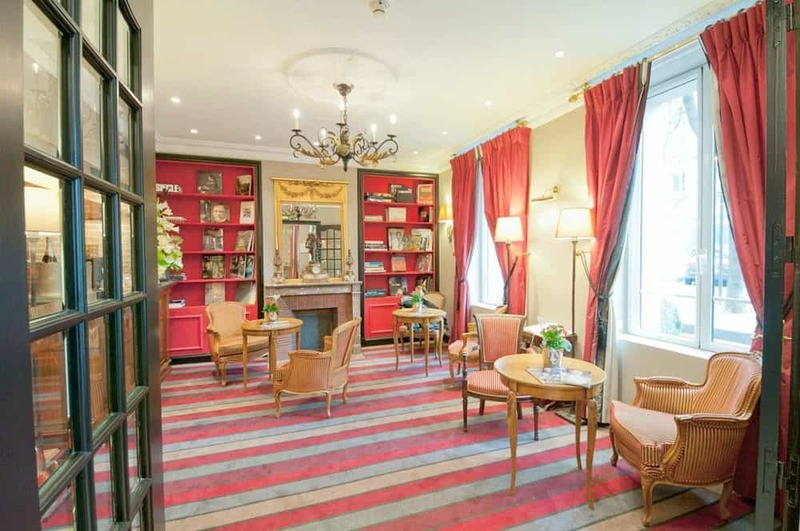 Housed in a traditional Parisian 19th-century townhouse and only a five-minute walk from the famous Champs Elysees is this small but stylish 4-star Paris boutique hotel. Sophisticated, modern but with enough artistic details to make it stand out from a crowd, the light and bright hotel prides itself on its eye-catching bold monochrome signature style throughout. 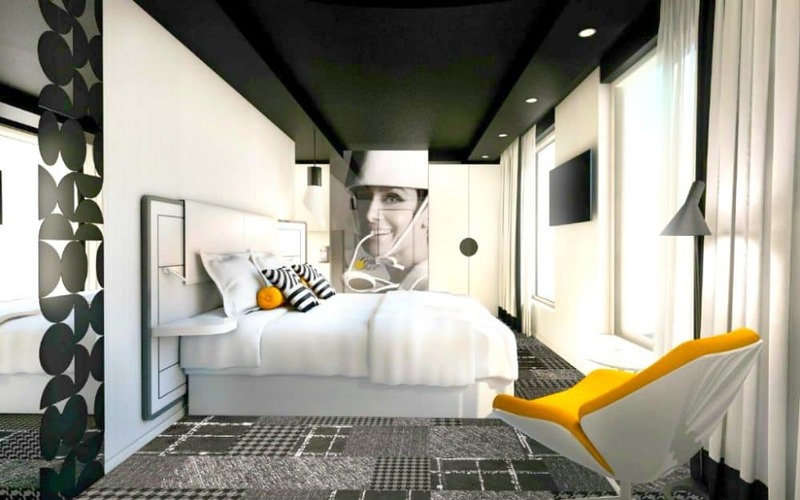 All the rooms at the exceptionally rated Hotel Le A were designed by French artist Fabrice Hybert and bedrooms offer flat-screen TVs, paid Wi-Fi and the latest in-room technology such as electronic blinds and iPod docks. Other standout features include in-room massages, a library filled to the brim with art and design books, a cosy lounge featuring a gorgeous open fireplace and a beautiful glass-roofed bar. Prices from €120 a night. 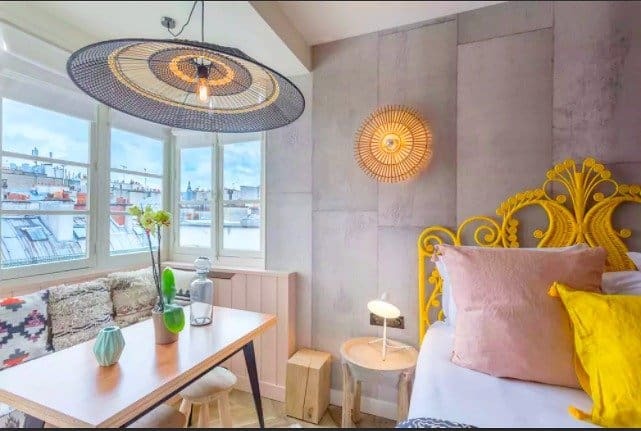 If you liked our collection of cool and unusual hotels in Paris we also have the best budget hotels in Paris, cool hotels in Berlin and quirky hotels in Amsterdam. I really want to go Paris.You blog is so nice and very informative. 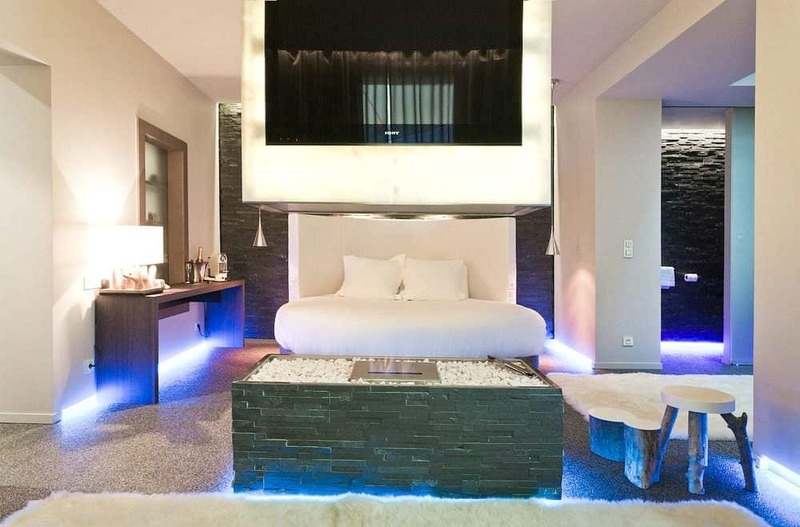 What would Paris, France be without having some great hotels to accommodate its guests? You can definitely see the passion put into these hotels. There is a great blend of industry (and some “futuristic industry”) and romance in the hotel themes. It’s very cool because France is really well known for both of those things, so to see them reflected in the art of the rooms is just really awesome. One day I will visit France, and likely will check into one of these rooms as well! I love this post Becky! Thanks for sharing. Now I’m dying to stay at One by the Five. It looks amazing. Yea…I would love to stay at The One by Rive one day!! The One by Five looks amazing, shame about the price though! I stayed in One by the Five last Valentines day and though it was extremely pricey it was quite the experience. Great service and out of this world rooms!